Fairfax (/ˈfɛər.fæks/ FAIR-faks), colloquially Central Fairfax, Downtown Fairfax, Fairfax City, Historic Fairfax, and formally the City of Fairfax, is an independent city in the Commonwealth of Virginia. As of 2015, the population was 24,013. The City of Fairfax is an enclave within Fairfax County. However, Fairfax County is a separate political entity. 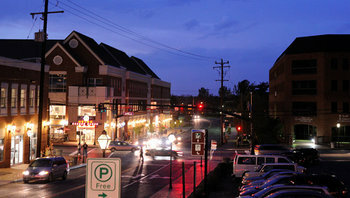 The City of Fairfax, and the area immediately surrounding the historical border of the City of Fairfax, also officially designated by Fairfax County as “Fairfax”, both comprise the county seat of Fairfax County. Situated in Northern Virginia, Fairfax is part of the Washington-Arlington-Alexandria, DC-VA-MD-WV Metropolitan Statistical Area. Fairfax is 16 miles (26 kilometers) southwest of Washington, D.C. Washington Metro’s Orange Line serves Fairfax through its Vienna Station. CUE Bus and Metrobus operate in Fairfax. George Mason University (GMU), Virginia’s largest public institution, is located in Fairfax. In 2013, 33,917 students attended GMU. Virginia International University, an international school, is situated in Fairfax. The city derives its name from Thomas Fairfax, 6th Lord Fairfax of Cameron, who was awarded five million acres (20,000 km²) in land located in Northern Virginia by King Charles. The area the City of Fairfax now encompasses was settled in the early 18th century by farmers from Virginia’s Tidewater region. The town was established as the Town of Providence by an act of the state legislature in 1805. The town (then described as a village) was the scene of the first land battle of the Civil War, the Battle of Fairfax Court House (June 1861). On June 1, 1861, a Union scouting party clashed with the local militia, though neither side gained an advantage. A second battle was waged two years later on June 27, 1863. At the Battle of Fairfax Court House (June 1863), Union troops were defeated. However, the battle delayed the movements of Confederate cavalry chief Jeb Stuart, with disastrous consequences for Lee at Gettysburg a few days later. Fairfax was officially renamed the Town of Fairfax in 1874. It was incorporated as a city in 1961, and under Virginia law was separated from Fairfax County (though it remains the county seat). In 1904, a trolley line was built connecting Fairfax with Washington, D.C.